WOODSTOCK, NY (October 13, 2018) - On Saturday, October 13, the 19th annual Woodstock Film Festival Maverick Awards Ceremony took place at Backstage Studio Productions in Kingston, NY. The venue, in the heart of Kingston’s uptown historic district, was packed with filmmakers, film industry members, community leaders, and audience members. Awards were presented to exceptional films and honorees in numerous categories. The evening opened with the first African American director to win an Academy Award, Roger Ross Williams, who gave welcome remarks and introduced festival Co-Founder and Executive Director Meira Blaustein. Tony®, Emmy® and Grammy®-winning, and Oscar®-nominated filmmaker Julie Taymor received the Honorary Maverick Award, preceding a special tribute screening of ACROSS THE UNIVERSE on Sunday, October 14th at the Woodstock Playhouse. Academy Award®-nominated and Emmy Award®-winning filmmaker Matthew Heineman received the Filmmaker Award of Distinction. for his debut feature narrative, A PRIVATE WAR. The film will screen on Sunday, October 14th at the Woodstock Playhouse. 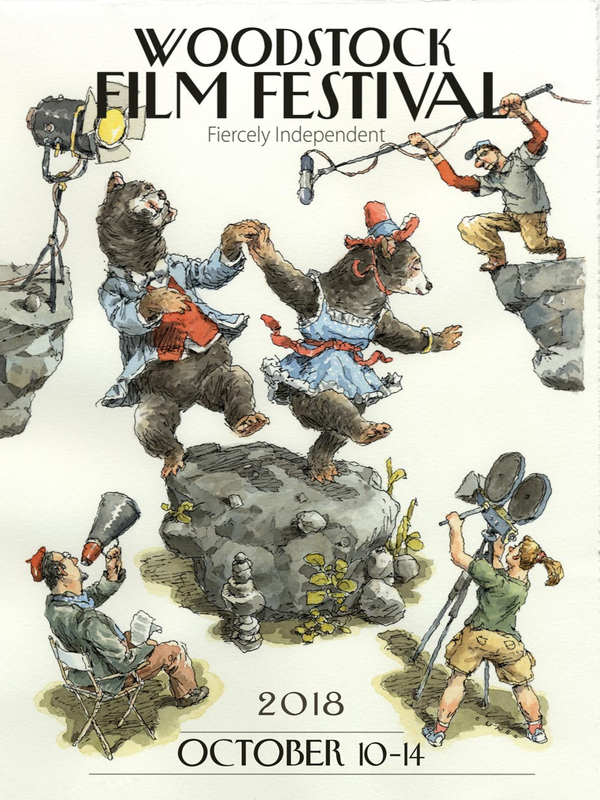 Films from the 2018 Woodstock Film Festival were honored at the Maverick Awards Ceremony with presentations for Best Narrative Feature, Best Documentary Feature, Best Narrative Short, Best Student Short, Ultra Indie Award, Animation Award, Haskell Wexler Award for Best Cinematography, World Cinema Award, James Lyons Editing Award for Narrative & Documentary Features, Best Short Documentary, and the Carpe Diem Andretta Award. The Gigantic Pictures’ Feature Narrative Award went to Paul Starkman for WHEELS. Honorable Mention went to Brendan Walter for SPELL. A Special Award for ensemble cast went to John Stimpson for GHOST LIGHT. Jury members included Catherine Curtin, Lori Singer, and Carter Logan. The Best Documentary Feature, sponsored by Films We Like, was presented to Assia Boundaoui director for THE FEELING OF BEING WATCHED. Honorable Mention to director Juliane Dressner and Edwin Martinez for PERSONAL STATEMENT. Jury members included Richard Rowley, Susan Margolin, and Joe Berlinger. Best Narrative Short sponsored by Gigantic Pictures, went to director Leonora Lonsdale for BEAST. Honorable Mention went to Alexis Gambis for MI HERMANO. Jury members included Jonathan Gray, Richard Abramowitz, and Blair Breard. Best Student Short sponsored by Gigantic Pictures, went to director Jisun Jamie Kim for A YEAR. Jury members included Isil Bagdadi, Janet Grillo, and Tim Guinee. The Woodstock Film Festival Ultra Indie Award, sponsored by Gray, Krauss, Stratford, Sandler, Des Rochers, LLP and Blackmagic Design, was presented to Alex Moratto for SOCRATES. Best Animated Short was presented to Mark C. Smith for TWO BALLOONS. Jury members included Joy Buran, Noelle Melody, and Jessica Milazzo. Best Short Documentary, sponsored by Markertek.com, went to Skye Fitzgerald for LIFEBOAT. Honorable mention to Lynne Sachs for CAROLEE, BARBARA & GUNVOR. Jury members included Jen Heck, Cynthia Kane, and Gene Fischer. The Haskell Wexler Award for Best Cinematography, sponsored by Panavision, went to Eric Bader for SPELL. Ellen Kuras served as the juror. “Choosing a single film in this category was not easy. There’s been an explosion of great cinematography this year, and all of the films considered for the cinematography award stood out. The James Lyons Editing Award For Narrative Feature, sponsored by Technicolor Postworks NY, was presented to Kristina Davies editor for UNLOVABLE. Jury members included Joe Klotz, Madeline Gavin, and Sabine Hoffman. The James Lyons Editing Award For Documentary Feature, sponsored by Technicolor Postworks NY, was presented to Rabab Haj Yahya editor for THE FEELING OF BEING WATCHED. Jury members included Keiko Deguchi, Ann Collins, and Sabine Hoffman. Special mention: WRESTLE. The World Cinema Award, was presented to Laurie Colbert and Dominique Cardona for KEELY & DU. A special mention to director Roxy Toporowych for JULIA BLUE. Jury members included Wendy Lidell, Thelma Adams, and Sabine Schenk. The Carpe Diem Andretta Award, sponsored by The Vincent J. Andretta Memorial Fund and presented to the film that best represents living life to the fullest, was awarded to director William Fichtner for COLD BROOK. Honorary Maverick Award was presented by Harry Lennix to Julie Taymor. Julie Taymor received the Honorary Maverick Award. In addition to receiving the award, the Woodstock Film Festival will have a Special Tribute Screening of ACROSS THE UNIVERSE, followed by a Q&A with director Julie Taymor and composer Elliot Goldenthal. Matthew Heineman received the Filmmaker Award of Distinction. In addition to receiving the award, the Woodstock Film Festival’s closing night film is Heineman's debut feature narrative, A PRIVATE WAR. Filmmaker Award of Distinction was presented by Molly Thompson and Alex Gibney to Matthew Heineman. The Maverick Award trophies are handcrafted by local artisan Steve Heller of Fabulous Furniture in Boiceville, NY. For more about out wonderful 2018 sponsors, click below. Join us again October 2-6 for our 20th Anniversary.